A selection in Parade’s roundup of “25 Hottest Books of Summer 2018” A Paste Magazine’s Most Anticipated 25 books of 2018 pickA Medium’s Books pick for We Can’t Wait to Read in 2018 listSet in a near future Washington, D.C., a clever, incisive, and fresh feminist twist on a classic literary icon—Sherlock Holmes—in which Dr. Janet Watson and covert agent Sara Holmes will use espionage, advanced technology, and the power of deduction to unmask a murderer targeting Civil War veterans.Dr. Janet Watson knows firsthand the horrifying cost of a divided nation. While treating broken soldiers on the battlefields of the New Civil War, a sniper’s bullet shattered her arm and ended her career. Honorably discharged and struggling with the semi-functional mechanical arm that replaced the limb she lost, she returns to the nation’s capital, a bleak, edgy city in the throes of a fraught presidential election. 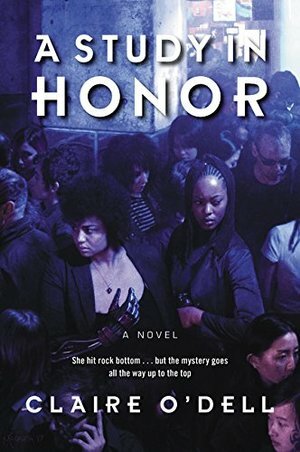 Homeless and jobless, Watson is uncertain of the future when she meets another black and queer woman, Sara Holmes, a mysterious yet playfully challenging covert agent who offers the doctor a place to stay.Watson’s readjustment to civilian life is complicated by the infuriating antics of her strange new roommate. But the tensions between them dissolve when Watson discovers that soldiers from the New Civil War have begun dying one by one—and that the deaths may be the tip of something far more dangerous, involving the pharmaceutical industry and even the looming election. Joining forces, Watson and Holmes embark on a thrilling investigation to solve the mystery—and secure justice for these fallen soldiers. I was given a copy of this book, free, in exchange for my honest opinion. This is a gender and race flipped Sherlock Holmes retelling. Though I was interested in it, I have to admit that I ended up enjoying it a lot more than expected. Dr. Janet Watson was a surgeon in the army, on the front lines during the new civil war. She was discharged when she was shot and lost her arm during one of the battles against the New Confederacy. Now that she is back in DC hoping to get her metal prosthetic replaced for one more fitting for a surgeon, she realizes that things are not going to get any better anytime soon. Once she realizes that the VA has no immediate plans to replace her metal arm anytime soon, she decides to stay in DC. All she needs is a job and a place to stay. She finds a job with the VA and then a friend introduces her to Sara Holmes, someone she is not sure she can stand. As Watson gets comfortable with her new job, new roommate and new routine, she uncovers a mystery that doesn't make sense, someone is killing civil war veterans. The first third of the book is getting to know the characters, Watson in particular but also Holmes. While it seems like a big deal that civil war veterans are being killed, that mystery doesn't really start until a third of the book. While I wouldn't say that this is a slow book, it is not fast paced either. There were parts of the book that I felt i was making progress only because I continued to read, there were other parts that seemed to fly by. Somehow it works for this book, it fits with Watson's style. The ending was explosive with the action that was happening on the page, but not with the resolution of the mystery. That was a bit more subdued, happening as Watson recovers in the hospital. There were small things that I enjoyed, like the nod to Octavia Butler that occurs once or twice throughout the book. The way that Holmes hair is described in locs and another character's hair is described as being in boxed braids. The way people either see them or overlook them in different situations. Those are the small things that make it apparent that the characters are black. But there was still something that was a bit off, as if the characters were black because the author wanted them to be black and not because they actually were black. I am not sure if that even makes sense. I really enjoyed this book. It was quiet with its observations even though what was going on around inside the book was very loud. I am definitely looking forward to continuing on with this series.